Hon. Alden McLaughlin, Premier of the Cayman Islands, on Friday 15 September 2017 delivered 15,000 lbs of relief aid to assist Anguilla in its post hurricane recovery. Anguilla, an Associate Member of CARICOM was pummeled by one of the most powerful Atlantic storms on record, hurricane Irma, on Tuesday 5 September. It damaged the main hospital, schools and 90 percent of the homes. 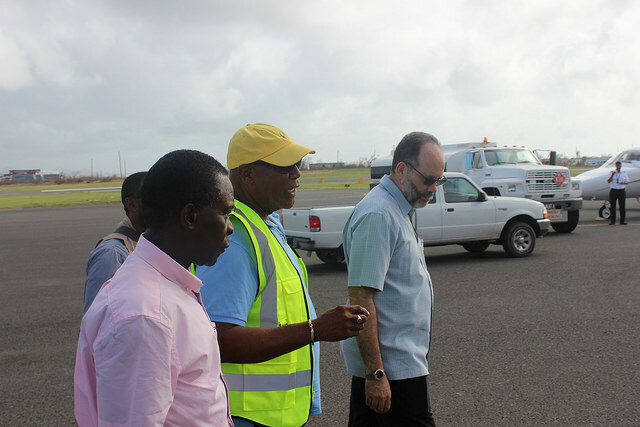 The Premier of the Cayman Islands, also a CARICOM Associate Member, conducted a tour of the hurricane ravaged Island and offered Anguilla’s Chief Minister, Victor Banks, assurances of his country’s solidarity and support. CARICOM Chairman, Prime Minister Dr Keith Mitchell of Grenada and Secretary-General Ambassador Irwin LaRocque toured Anguilla on Wednesday. During their interaction with Chief Minister Banks, he had highlighted the pressing need for food, water, building supplies in this critical stage of the Islands recovery. The cargo laden plane arrived in Anguilla with 5,000lbs of drinking water, canned and other non-perishable food items and non-medical items including 100 tarpaulins from Hazard Management Cayman Islands and 250 relief kits from the Cayman Islands Red Cross. Medical supplies were provided by Anguilla’s Government through the Cayman Island Health Services Authority, Health City Cayman Islands, Chrissie Tomlinson Memorial Hospital and other local pharmacies. The Cayman government also dispatched a team of medical practitioners comprising two doctors and nurses, led by Dr. Glaister Bell from its Health Services Authority to remain in Anguilla for two weeks. A second team will replace them at the end of that period. Mr. McCleary Fredrick, Director of Hazard Management Cayman Islands has also been sent to Anguilla for two weeks to provide expertise along with the Anguillan disaster management team. Cayman Islands’ government has made provisions for a number of Anguillan citizens, some requiring medical treatment, to travel to the Cayman Islands on the return flight later today. They have also extended support to evacuate other individuals who are legally in Anguilla and wish to travel to Cayman to connect to other destinations. 1. Aerial view of hurricane ravaged Anguilla. 2. Chief Minister of Anguilla, Mr Victor Banks (Middle); updates CARICOM Chairman, Prime Minister of Grenada, Dr the Hon. Keith Mitchell (L); CARICOM Secretary-General, Ambassador Irwin LaRocque (R) during their tour of the damage on Wednesday 13 September 2017.